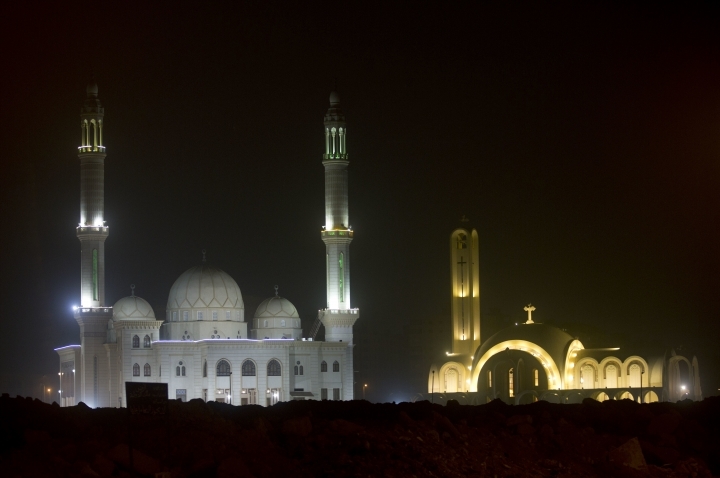 CAIRO — Egypt's president on Sunday inaugurated a new cathedral for the Coptic Orthodox Church and one of the region's largest mosques in a highly symbolic gesture at a time when Islamic militants are increasingly targeting the country's minority Christians. Abdel-Fattah el-Sissi, a general-turned-president, has made sectarian harmony a cornerstone of his rule, fighting Islamic militancy while advocating equality between the overwhelming Muslim majority and Christians, who account for 10 percent of Egypt's 100 million people. "This is a historic and important moment," said el-Sissi inside the cathedral. "But we still have to protect the tree of love we planted here together today because seditions never end." The Grand Sheikh of Al-Azhar, the world's primary seat of learning for Sunni Muslims, echoed el-Sissi's sentiments in comments also made at the cathedral. The two places of worship, he said, stand as a symbol in the face of "attempts to undermine the country's stability and sectarian seditions." El-Sissi's widely publicized policy to staunch sectarianism, however, has done little to protect Christians in rural Egypt, where Muslim extremists frequently attack their homes and businesses or force them to leave their homes after violent disputes. 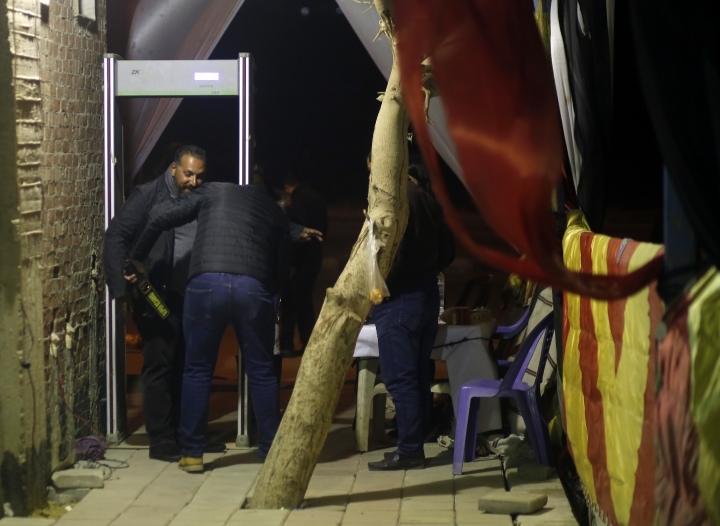 Critics and activists say discrimination against Christians there is often tolerated by local authorities and branches of the security agencies. Christians also complain of stringent restrictions on the construction of churches. 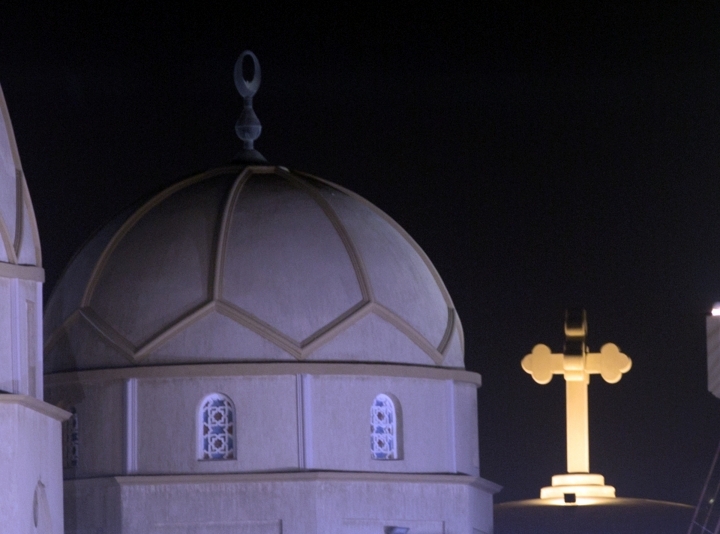 But Sunday's opening ceremony in Egypt's New Administrative Capital, el-Sissi's brainchild that is located in the desert east of Cairo, stressed what the pro-government media like to call the "unbreakable national fabric" of Christians and Muslims. Entertainers and chorus lines took to the stage to sing about the two faiths living peacefully side by side. Short films on the same topic were also screened. The ceremony's presenters portrayed the construction of the cathedral and the mosque, which took 18 months to complete, as a message to humanity. "It is a message to the whole world that Egypt is a nation for all," said one presenter. The ceremony, attended by Palestinian leader Mahmoud Abbas and a host of Arab dignitaries, included recorded video messages of support from the region's top Christian clerics as well as Pope Francis. Speaking in Italian, Pope Francis said: "With joy I greet all of you on the joyful occasion of the dedication of the new Cathedral of the Nativity, built in the new administrative capital. May the prince of peace give to Egypt, the Middle East and the whole world the gift of peace and prosperity." The inauguration ceremony, which ended with a display of fireworks, took on added significance because it fell on Christmas Eve for Egypt's predominantly Coptic Orthodox Christians, and just hours after a police bomb squad major was killed trying to defuse an explosive device near a Cairo church. 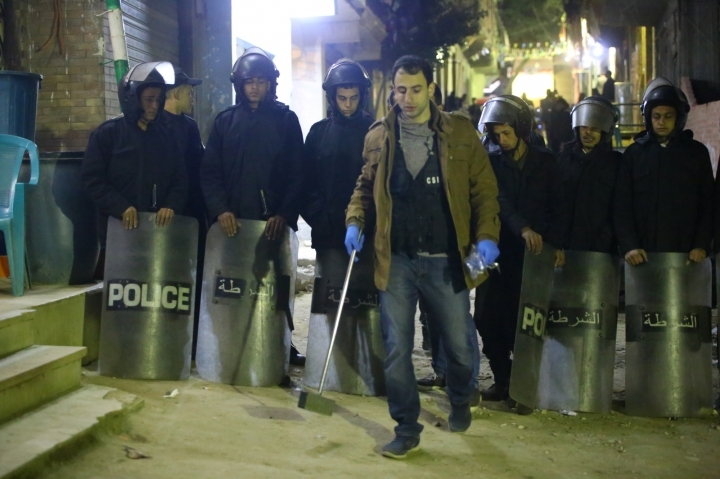 El-Sissi and participants observed a minute of silence in memory of the fallen policeman. The late Saturday blast came a little more than a week after a roadside bomb hit a tourist bus near the Giza Pyramids, killing three Vietnamese tourists and their Egyptian driver. 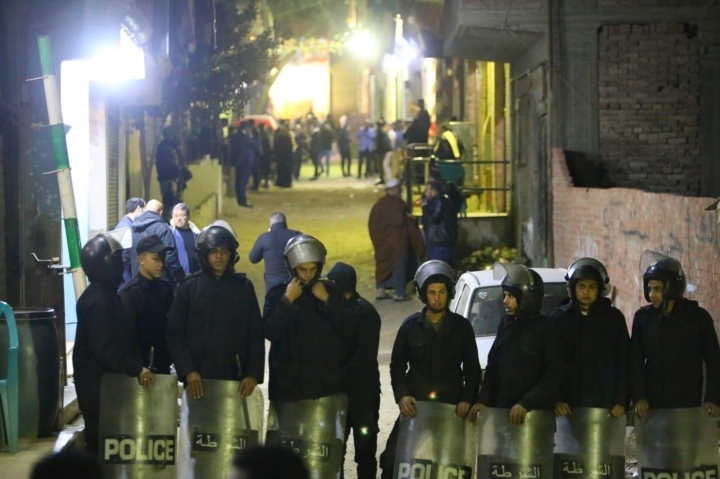 It likely will compel authorities to further tighten security around churches ahead of the Coptic Orthodox Christmas. Already, armed policemen guard churches and security guards check the identity of visitors. Metal detectors have also been set up outside churches. The heightened security followed a spate of attacks claimed by the Islamic State group which has targeted churches and buses carrying pilgrims to remote desert monasteries, killing more than 100 Christians over the past two years. 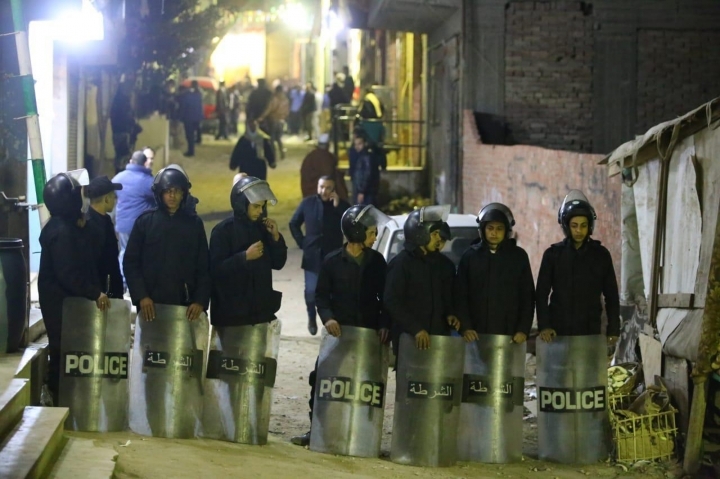 Egypt has been battling Islamic militants for years, with the army and police now engaged since early last year in an all-out campaign to eradicate them, throwing into battle tens of thousands of troops backed by armor, fighter jets, helicopter gunships and warships.